One of the goals of the Balkan Bacchanal has always been to provide a space for musicians to try new things and in new combinations, and Sabaya is a perfect example of why that’s important. Sabaya is Diana Strong (accordion), Briana Di Mara (violin), and Faisal Zedan (percussion), a newly formed trio of accomplished Bay Area musicians performing traditional and original melodies inspired by the music of the Balkans and Near East. With rich harmonies, danceable grooves, and soulful improvisation– joined by special guests Jake Leckie on bass, Gary Hegedus on oud, Gregory Masaki Jenkins on clarinet– Sabaya (meaning “the girls” in Arabic) is more than just the girls! It’s been awhile since Janam have played at the Bacchanal, so we’re psyched to hear them with their new lineup! Janam (My Soul) blends Balkan, Near Eastern and American roots and original music, creating rapturous acoustic textures, whirling rhythms and stunning vocal harmonies. 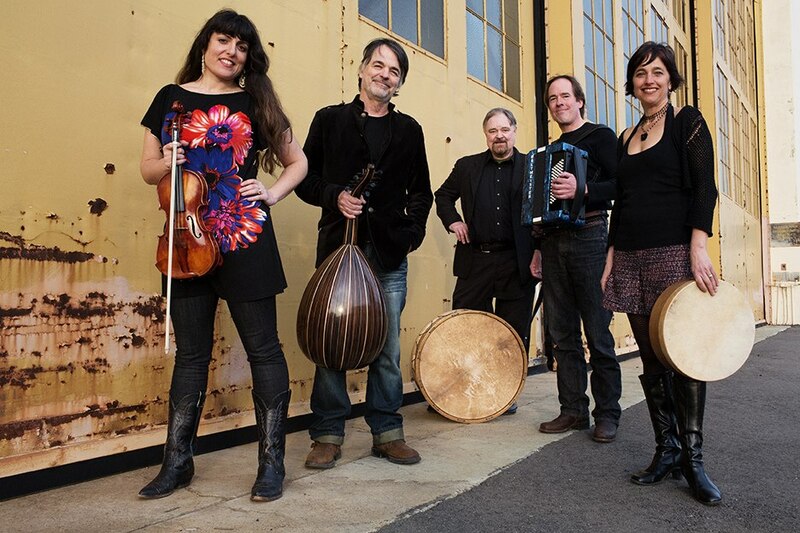 Led by Kitka Women’s Vocal Ensemble veteran Juliana Graffagna, Janam unites some of the San Francisco Bay Area’s most imaginative and devoted practitioners of Balkan and Near Eastern music, who weave together Eastern exoticism, gritty Appalachian folk melodies and their own inspired compositions. The resulting music is transcendent and irresistible. Janam features: Dan Auvil (percussion and kaval), Tom Farris (laouto and guitar), Juliana Graffagna (vocals and accordion), Gari Hegedu (oud, saz, mandocello and violin), and Lila Sklar (violin and vocals). The Balkan Bacchanal is excited to welcome the newly-formed Incognito Express, featuring some of the hottest players in the Bay Area’s Balkan scene! Incognito Express will take you on a trip through Eastern Europe with exciting Romani, Greek, Bulgarian, Serbian, and Macedonian music as well as Balkan-inspired originals. The band features Darren Johnston (trumpet), Gregory Masaki Jenkins (clarinet and alto sax), Dan Cantrell (accordion), Paul Marini (sousaphone), and Marco Peris (tupan).